Microsoft and Yahoo announced a partnership that will allow Microsoft to better compete with Google by consolidating its market share in search and search advertising. Microsoft will acquire a 10 year license to Yahoo's search technology and it will power Yahoo Search. Bing will become Google's main competitor in search, with a market share of about 28% in the US (comScore, June 2009) and about 11% worldwide (StatCounter). After a successful relaunch in May, Microsoft's search engine didn't convince many people to switch from Google. Bing's ranking algorithms have been improved and Microsoft has a lot of interesting specialized search engines (a great interface for image search, an excellent travel site), but the overall experience doesn't offer too many reasons to use Bing as your main search engine. "Through this agreement with Yahoo!, we will create more innovation in search, better value for advertisers and real consumer choice in a market currently dominated by a single company. Success in search requires both innovation and scale. With our new Bing search platform, we've created breakthrough innovation and features. This agreement with Yahoo! will provide the scale we need to deliver even more rapid advances in relevancy and usefulness," said Steve Ballmer, Microsoft's CEO. "As a result of the deal, Microsoft, which has great technologists and deep pockets, will have the scale to bring users faster, more useful and more personally relevant search. Competition equals innovation. But with one player dominating 70% of search, that field has been pretty lopsided. This transaction will create a healthy competitor that’ll keep everyone on their toes," said Carol Bartz, Yahoo's CEO. I don't think scale is the missing ingredient from Bing's recipe: Google managed to create a search engine that offered great results even when it was just a small project. "Google ended 1999 averaging about 7 million searches each day, a roughly 70,000% increase over the 10,000 searches per day that were performed on the Google site in December 1998," announced a newsletter from 2000. Microsoft should focus on innovation, on finding new ways to improve search quality and to make the results more useful, instead of trying to better compete with Google. This is a major anti-trust concern for small businesses and their ability to have a voice in the SERP arena. Google ignores any company other than the largest when it comes to service. Bing/Yahoo will do the same. We need more competition in search not less. I think you will see a million articles from the same people who said that vista was going to be so wonderful who are now saying 7 will be so wonderful saying how they got a good result with bing. I disagree. Google certainly gained tremendous insight when it scaled, as will Bing. I was at the Bing launch and know first-hand that the technology is poised to benefit from usage. I was also witness from the inside out how Google benefited from scale when it got a similar deal with Yahoo!. Yahoo! may be a search shadow of itself than it was when Google struck the deal. I think it's naive to dismiss this as anything but a major move by Bing into search with Yahoo!. There's plenty of time yet to innovate, an area that Google search has done by adding options, which is kind of neat but not overwhelming innovation. Wow! 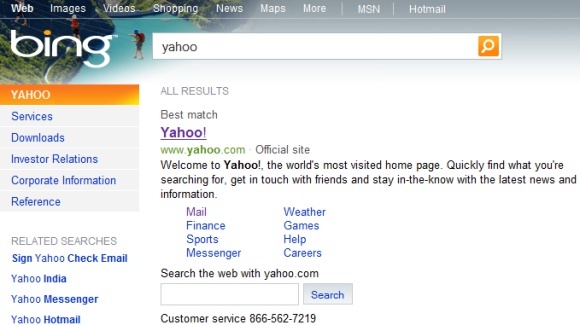 Finally Microsoft has reached a deal Yahoo for an internet search partnership. Will the newly announced deal between giants Microsoft and Yahoo be a good thing? Got to wait and see. But atleast Microsoft and Yahoo deal is straightforward and not complex at all and ofcourse, the negotiation talks have been going for long. I was just curious to know all the past negotiations between Microsoft and Yahoo so collected all the articles and links (more than 200) related to the current merger and the previous events or negotiations between Microsoft and Yahoo. If you are interested check the link below. I think people have become mindless zombies with Google and Apple. Microsoft and Yahoo have taken many public beatings verbally from the media. These are very bing companies, and you can only take that pressure for so long before retorting with a great product/service. Do some research and you'll see that bing was a sneaky 1998 project that showed suddenly without notice. I see live messenger will be collaborating with yahoo messenger, then live email, with the live api. With Office 2010 being web based and interacting with sharepoint, that yahoo audience will bring Microsoft plenty of money. That type of money Google would like to be making now. I like Bing and wish them best success in the marketplace. How does this give more consumer choice? It's eliminates a choice. Since both Bing and Yahoo have competed with Google Search for a while, I think its just fair to let them try to work together for a change. We'll see what comes out of it, and will use it if it gets praise for being good. I can’t believe this deal was in the making for ten years. think of it this way, Google has been used as a household term for finding things online. I have heard so many people say "google it" instead of "search for it online." I think that will have a big impact on it. It might just be me, but i think that googleing something sounds a whole lot better than yahooing or binging something... but that's just me. It took 10 years for the deal. It'll take another 5 for integration.By that time, Google would have marched long ahead. Then MS, Yahoo will search for some other integration.. There is something to do be done in the search engine market, and Bing might have enough financial muscle to achieve it. As far as I'm concerned, I've seen a drop in relevancy when it comes to Google: its "trust rank" or whatever you call it sacrifices relevancy on the alter of big domains. A big domain can post a totally useless article about a small company, and outrank this company. Same goes for generic, automated pages (for instance CD or book reviews) which rank in the top 10 for "be the first to review this book/cd" (the content in a nutshell), outranking valuable and manual articles. So I wish Bing the best of luck. Google won't rule forever in the search engine market, but it's solid enough everywhere else. Its really sad though. Very first search engine I've knew was yahoo since I was at very young age. It's pretty, its fast and its works. But, for me..Google is the best. But what I feel that Bing can not overtake Google. Google is the best and is very user friendly also. No other search engine can replace Google atleast 100s of years..
Come on guys, Google can't be replaced by anything. It's not only Search (web, images and video), it's Maps, Voice, Health, Blog Search, Similar Images, Calendar, Docs, Reader, Code, GWT, Chrome, Android and soon Wave and Chrome OS. I've been given the sandbox accounts and it's absolutely amazing. The openness of the platform makes it possible to develop extensions and (hopefully) will integrate all services in one. Google introduces innovation (while making profit), real innovation like Wave, while other giants wants to profit introducing no innovation at all. I would rather like to use some Bing integrated with Google than have both services to choose from. just imagine that. When I tried Microsoft's search engine in the past, I always went back to Google. But with Bing, I switched to Bing and haven't gone back to Google. It has improved significantly. This is end of Yahoo. It will slowly bleed to death. There was a weakness in Google which Bing, rather than improving, has made it worse. I have blocked Bing.com from all the users' accounts on my PC. I am referring to the ability of the user to change his/her own Home page settings (esp. Content Filtering) freely. Bing, as we all know, will even play videos within little screens - absolutely great for some (in fact for me too, BUT ONLY SOME OF THE TIME!). Microsoft has recently started forcing Bing down the throats of Firefox users too by hijacking the default search engine of those installing the latest MSN live update. But wait, even if you manually change back the home page and the default engine in the search bar to Google.... wait for it... Bing still stays as default search in the url bar keyword search feature!!!!! So it seems at first there is no way for the lay user to retrieve google back as the default search engine on the url bar (many people use it to type their searches because it has a bigger and more friendly box). Such kind of approach cannot possibly be described as bundling and can only be registered as another antitrust violation by Microsoft bordering the definition of fraud. That's because there was no reason to do that with an MSN update and the user who installed them were not warned. Together with the secret installation of an irremovable .NET related Firefox addon bundled with a certain patch last thursday, it only makes things worse for Microsoft.